Boundless joy is in store for all those who visit Kerala. The beautiful God's Own Country is the land of bliss. From scenic shores along the Arabian Sea to lush locales nestled in the lap of the Himalayas, untouched forests to the unique stretch of backwaters navigable by houseboats, there is much to wonder. The colorful culture, pampering Ayurveda treatments, delightful cuisines along with indulging hospitality makes for a lifetime experience. The cherished memories of a family vacation is as precious as a romantic honeymoon, while there is absolutely nothing better than Kerala to escape the chaos and soak the pleasure of nature. Nestled between the cerulean spread of Arabian Sea and the range of Western Ghats, Kerala is among the most beautiful places in India. Due to its abundance of blessings of nature it is often compared to the like of heaven on Earth. So vast and diverse are its pleasures that it makes you feel thousands of different feelings and each one special in their own way. Here you can boast of sailing over the ethereal backwaters on a lavish houseboat equipped with modern luxuries. The walk through the lush tea gardens is refreshing as is learning about the aromatic spices and herbs. The same ecstasy is felt while watching the sunset on a shore. Game drives to national parks and the bird sanctuaries bring you a little closer to nature. Ayurveda, unravels the ancient secrets to health and wellness with time-tested therapies and procedures. Dating back to centuries, the history and culture are equally mesmerizing. Be it the festivals, dance, martial arts, handicrafts to the mouthwatering cuisines, every aspect of the state is heavenly. Navigating the charming backwaters, houseboats are not just a ride but a beautiful experience. Equipped with luxuries and comforts, each of these wooden boats offer fascinating trips as well as overnight stays. Float in serenity enjoying the beauty as well as traditional hospitality as you create memories for a lifetime! Unique and spellbinding, the backwaters in Kerala are a merging of rivers, canals, lakes, and the sea. The charming ecosystem is a beauty beyond words offering an experience that mesmerizes all. Feel the tranquility enveloping your senses, hear the call of birds, enjoy the company of nature and loved ones. Romance needs care and what better than the beautiful God's Own Country for a memorable honeymoon. From the scenic shores to the endless backwaters, misty hills to mysterious wilderness, soothing Ayurveda to some incredible experiences, thrilling adventures to loving hospitality, make every moment of your holiday special with your better-half. Carpeted with emerald tea gardens surrounded by misty peaks, hill stations in Kerala are a picture-perfect beauty. Fresh breeze soothes while aroma of tea and spice gardens fascinates your senses. The thrill of adventure, wildlife excursion along with blissful views offers the amazing backdrop of memories of a lifetime. Let the magic of Ayurveda work on your mind, body and soul! Rejuvenate your senses with Ayurveda tours in Kerala. Unarguably, God's Own Country enjoys a strong bond with the science of life and longevity. Here, the sunshine and the monsoon acts as a healing balm, while a unique lifestyle celebrates this ancient tradition. Lose yourself as you make your way amidst the verdant jungles on a houseboat. Wildlife tours in Kerala are not just about boarding a jeep and witnessing the rich flora fauna! Rather, it's about experiencing and imbuing every bit that nature has to offer. Taste the wilderness and spot animals you've seen only in the books. Think Kerala and a slideshow of picturesque beaches start featuring in your mind immediately. Oozing timeless beauty, adorned with iconic attractions and fringed with swaying palm and coconut trees, the beaches are truly mesmerizing. No wonder, beach tours in Kerala sell like hot cakes. Make your dreams of a perfect beach holiday come true at Kerala. Delight in a dreamlike date with Mother Nature by staying in a treehouse amidst magical jungles. 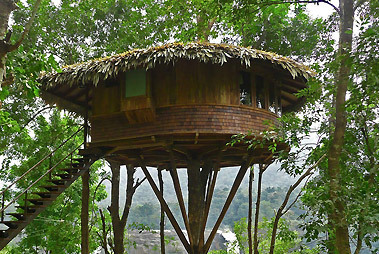 Grab your golden chance to relax in luxurious, comfortable and tranquil tree houses in Kerala. Wake up to some of the best sights and sounds. Marvel at the forest from a unique angle. What else do you want to leave all your worries behind? Only a few lucky ones get a chance to take their family on dreamy vacations. Surprise your near and dear ones with family holidays in Kerala. The tropical paradise of India welcomes you to spend good times with your loved ones and help you curate lifetime memories. Many 'Wow' moments await you here! Make your summer special by traveling to 'God's Own Country'. Escape into the world of reservation with Kerala summer tour packages. Lose yourself amidst scenic tea estates and soothe your senses in the lap of blissful nature. Indulge in unlimited fun at the scenic beaches. The delightful state has a surfeit of surprises to offer. Soothing souls with delights, Kerala in winter is simply the season of cherished memories. Be it a getaway with family, stolen moments of love on honeymoon, sessions of Ayurveda that rejuvenate the spirits, exhilarating adventures including wildlife expeditions to a glimpse of the vibrant culture, winter tours to Kerala create unforgettable experiences. Bringing abundance of joy to all, Kerala in monsoon is heavenly. The first of the rains in India showers here. The season of rains comes with natural beauty at its best, vibrant festivals, pampering Ayurveda sessions, romantic backwater cruise, exciting roar of waterfalls, thrilling adventure and charming experiences welcome all to come and fall in love with bliss!